Dolpo, was first settled by Rokpa farmers and Drokpa nomads from Tibet in the 10th century. It is one of the highest inhabited places on earth, with scattered fortress-like villages and monasteries nestling amongst mountains of stark, ascetic beauty. Though part of Nepal today, Dolpo remains culturally and economically firmly tied to Tibet , the people of this desolate area are cut of from their southern neighbours by snow-covered passes for much of the year. This is fascinating and difficult country to travel in. Peter Matthiessen's The snow leopard and David Snellgrove's Himalayan Pilgrimage have contributed to the mystique and attraction of Dolpo. Both writers visited the Shey Gompa, to the north of the Phoksumdo lake, in inner Dolpo. This is the goal of most trekkers but this Dolpo trek will take you even further into this mysterious land. Dolpo is Bon-pro country, where people practice a shamanistic religion predating Tibetan Buddhism. This upper Dolpo Region was open to foreigner visitors since 1992 and need special permit and accompanied by government liaison officer. The lake is spectacular, it is 4.8km long, 1.8km wide and said to be 650m deep. 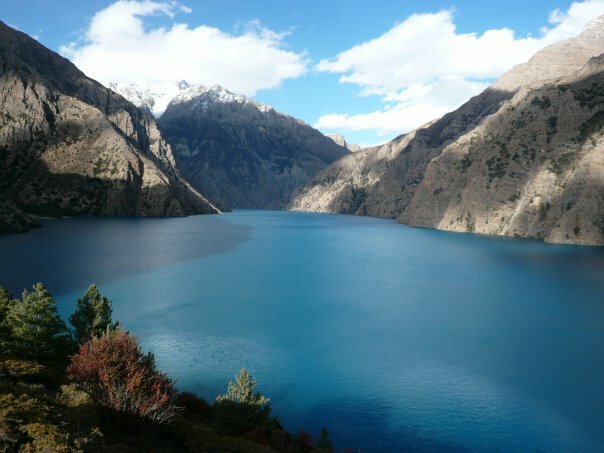 It is known for its aquamarine color a greenish blue similar to a special Tibetan turquoise .There is no aquatic life in the lake, which helps to make the waters brilliantly clear. If you toss a rock in, you can watch it for a long time as it sinks to the bottom. According to legend, Phoksumdo Lake was formed by a spiteful female demon. In Buddhist Himalaya, David Snellgrove recounts how the demon was fleeing from the saint Padmasambhava and gave the village people a turquoise after they promised not to tell that she had passed by. Padmasambhava turned the turquoise into a lump of dung, which upset the local people so much they revealed the demon's whereabouts. She, in return caused a flood. It is said you can see the remains of a village below the lake's surface.